We spent years looking for the best match to our favorite apricot, Sugar Pearls. You can imagine our elation when we discovered this scrumptious variety was the perfect pollinator! Sweetly aromatic, richly flavorful and juicy, this Honey Pearl Nectacot has its own attributes. 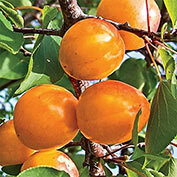 Its very late bloom time avoids damaging late frost, so it bears heavy yields of crack-free fruit. 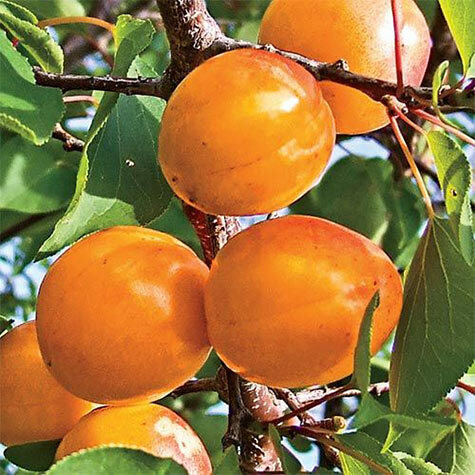 Delectable nectacots have ambrosial, deep orange flesh and red-blushed skin, ripening to perfection in July. Zones 4-7. PP27166. Now available in Reachables™ size! 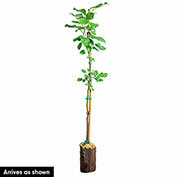 Honey Pearls™ Reachables™ Nectacot™ Tree produces full-sized fruits, but on a smaller tree. That makes it easier to fit into your garden, orchard—or even a container. It's also easier to manage than full-sized trees. One person can prune, spray, net and harvest the tree—all while standing on the ground. 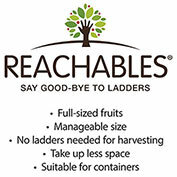 Note: Because their full-sized fruits grow on smaller trees, Reachables™ require a tree support. Depth: The top of the Ellepot container should be even with the soil level. Light Required: Full sun. Needs full sun for maximum flower and fruit production. Flower Form: 1 1/2 inch flowers.